Efficient DNA and RNA extraction from patient samples from small volumes of biofluid for diagnostic purposes is less invasive than requiring larger volumes or biopsied tissue. The DNA and RNA Sample Extraction kits can be used with small volumes of blood, saliva, or tissue culture media. A biocookie present within a special pipette tip binds the DNA or RNA and provides enough material for PCR. 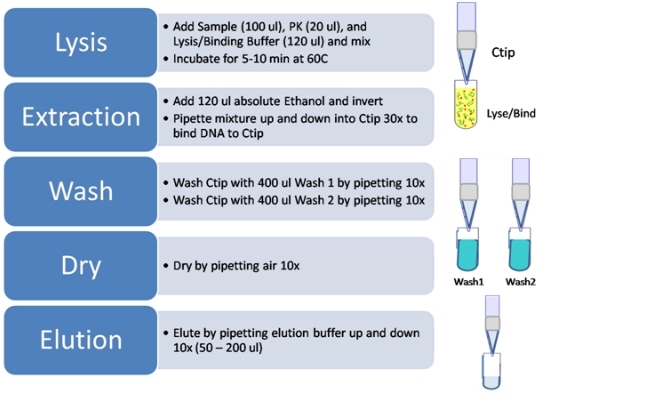 The extracted DNA or RNA can be used for minute volume PCR for diagnostic purposes. Visit our partner BioSample for more details.